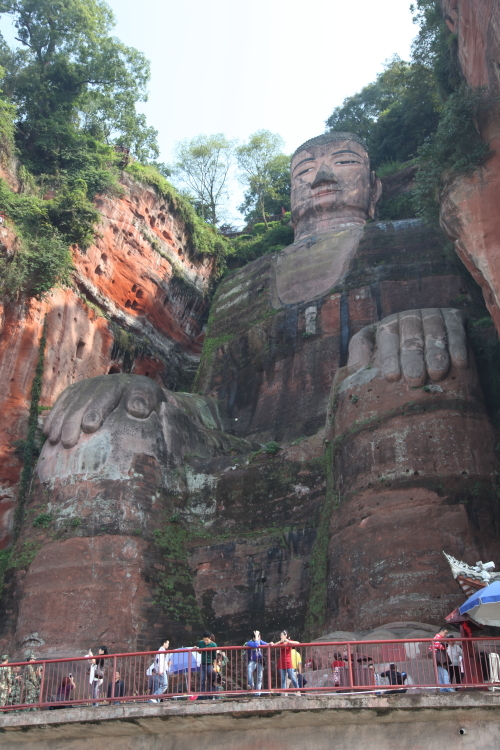 One of the things I really wanted to see in Sichuan was the Leshan Giant Buddha, the largest stone Buddha in the world. 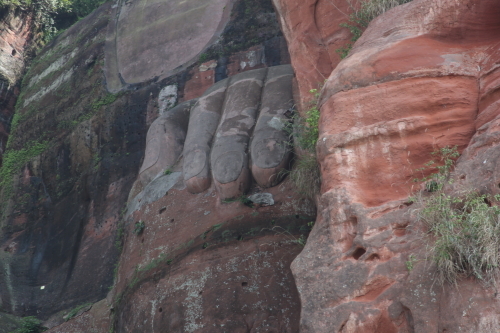 Carved into a cliff face at a river junction you can climb the roughly 71 metre (233ft) statue or, for a more relaxed viewing, catch a ferry. I chose the ferry option! One of the advantages of the ferry is that you can see the magnificent statue in its entirety. 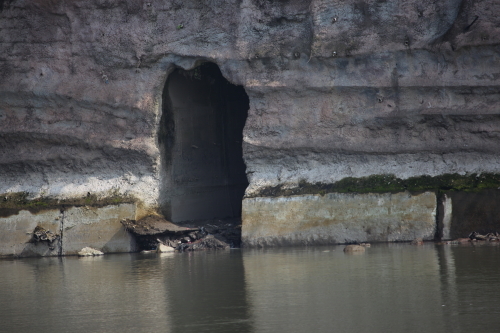 Although I knew how big it was, nothing can prepare you for the spectacle of seeing this huge Buddha slowly come into view as the ferry leisurely flows along the river. You can see the people climbing the Buddha and they look like ants. 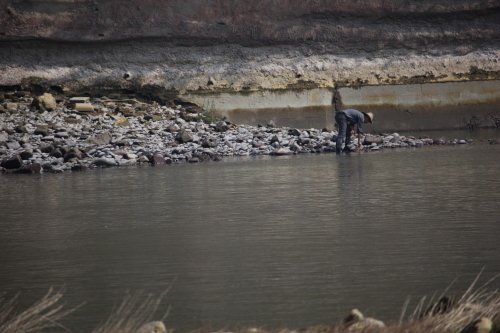 We realised we weren’t going to make it back to Chengdu without a toilet stop and that’s when the fact that our driver couldn’t speak a word of English and we couldn’t speak a word of Chinese became a real issue. As we tried to mime needing to go to the toilet using hand gestures, I was beginning to think that not getting to a toilet wasn’t going to be a problem as we were more than likely about to be arrested! Luckily one of the women selling tickets for the ferry understood our dilemma and we were soon being guided to the much needed facilities. Relieved, in more ways than one, we sat back for the two hour trip back to Chengdu. I made sure to keep my eyes open for the pug we had seen sitting outside a store on our drive to Leshan. I was convinced it was a statue, Paul was convinced it was real. Sure enough the very live pug had moved and was now sleeping on its side. I was so happy to see it as we had only recently lost our beloved pug Wolfy. With bittersweet memories we arrived at our hotel. We had a few hours to spare and decided to walk around the neighbourhood. The noise and the traffic – featuring swerving buses, cars and bikes – has to be seen and heard to be believed. Crossing the roads was a real challenge but we just followed what the locals were doing. We went into shops looking for panda souvenirs and weren’t disappointed. Again we found the people to be friendly and helpful and extremely curious. We felt safe in our environment and were happy that we ventured out on our own. In fact the only scary thing about Chengdu was just how much panda paraphernalia they had for sale! Wow love to see the Giant Buddah one day the photos look amazing. I think you and Alvin would love it. You’ve climbed the Blue Mountains so you could climb the Buddha!